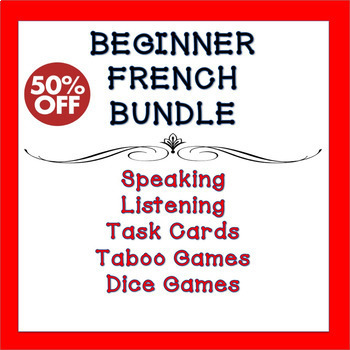 BUNDLE: 30% OFF Do you wish your beginner level students would speak more French? Do they have a hard time with listening comprehension? They may need some new ways to practice. Your beginner level students are learning and have already learned enough French to start speaking, but they need prompts and guidance. Speaking and listening skills are usually more difficult for our students and that's why I've put together this unique bundle to help develop those skills. Your students will develop French speaking and listening skills and it will be a lot of fun at the same time. Don't need everything in the bundle? Would you like to add non-related resources to your purchase? That's ok, you can still get 20% off your purchase of $20 or more with my Build Your Own French Bundle option! No sale items or other already discounted bundles can be included. Listening Comprehension: Dictées are a fabulous way to practice listening comprehension and writing skills at the same time. There are 15 included in this bundle, and you're going to love the creative way I've come up with to practice numbers. Challenging, but a lot of fun! Check out the links below. Task Cards: Nothing says cooperative learning like task cards. These focus on expressions with aller, avoir, être and faire et la rentrée scolaire. Dice Games: These games have always been a favorite in my classroom. Are your students as competitive as mine? Tons of fun and great for review.